There is a lot being written electricity storage these days, and capacity markets, and the integration of variable renewable energy resources. Most of the material originates with lawyers, philosophers, sales people, consultants, politicians and other economists. I invite you to listen to a professional engineer and system operator, very carefully, for 10 minutes. The system operator is Leonard Kula P. Eng.,Vice-President, Market & System Operations and Chief Operating Officer of Ontario's IESO. If low greenhouse gas emissions are a genuine goal, the messages are pertinent far beyond Ontario. 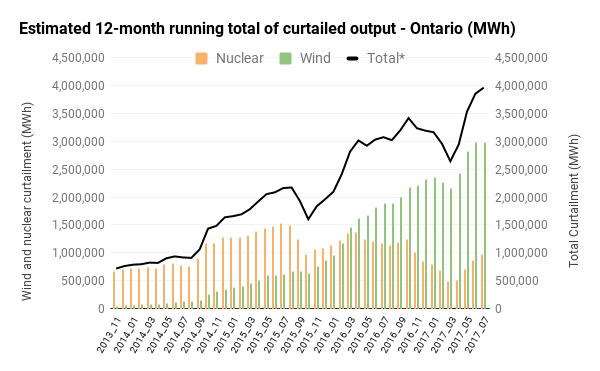 Over the first 7 months of 2017 the IESO shows ~2.8 terawatt-hours (TWh) generated by natural gas-fueled suppliers, which is only about 3.5% of all generation. 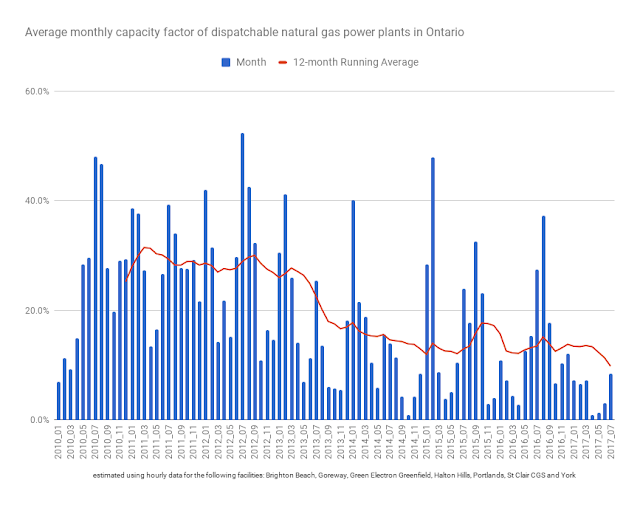 The output from gas is down over 60% from the same period in 2016, which should push the greenhouse gas intensity of IESO grid generation down to around 15 kilograms CO2e per megawatt-hour - superb for grids that aren't entirely in jurisdictions blessed with plentiful hydro-electric generation sites. From a low emissions standpoint Ontario's system operator might be considered THE system operator. Lower gas use is one characteristic of Ontario's electricity system of late. A less positive characteristic is rising curtailment of contracted supply - notably from wind. While most curtailment looks to be due to surplus generation, either globally or in particular regions of the grid, there is another operational aspect of curtailment closely linked to the decline in gas generation. ...many commentators...have been skeptical about the ability to operate the grid with little of the gas generation (and previously coal) online, and ready for ramping. I believe Ontario's actual operators of the system - the ones who do it on a daily basis - have a story to tell. That story would likely include improved forecasting, revised wind turbine (and perhaps solar panel) regulation to provide a programmed reactive power element, and rationalized market bid rules forcing the curtailment of wind and solar output prior to impacting nuclear units. It is variable renewable energy systems that need to be flexible. Kula indicates the way to make variable renewable energy systems flexible is by curtailing their output. We added the ability to dispatch the variable generation facilities that are connected to the grid in 2013, and they are very fast acting resources. At times we have to reduce the output of these facilities to go ahead and manage congestions and/or surplus conditions, and once they dispatched down they are very quick and flexible to be dispatched back up. The IESO's Kula spoke at the 2017 Stakeholder Summit. The IESO requires you register before viewing the recordings (it's a painless process). The section I am addressing is the panel on "Building Flexibility into the Electricity System". While I highly recommend the 10 minutes at the start of the panel in which Kula delivers his presentation , Rob Coulbeck is also worth listening to, as is the Q & A session.